The Japanese are a nation of foodies, take what they eat very seriously indeed, and talk about it a lot. It is no surprise then, that food expressions are used to describe a couple of peculiarities of Japanese grammar. 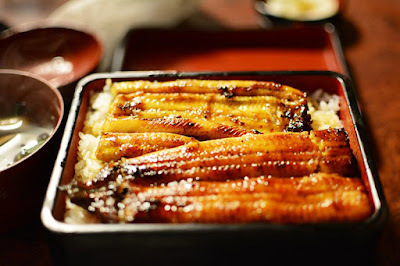 Unagi means "eel" in Japanese, and is a summer delicacy that will cost you at least 1,000 yen, usually for those imported from China, and at least twice that for home-grown ones. Konnyaku is the romanized spelling of the Japanese pronunciation of konjac (Amorphophallus konjac), a plant used to make a jelly much used in Japanese cuisine - especially oden - and which is related to the very smelly plant that has the world's largest flower, the Amorphophallus titanum. Anyway, an unagi sentence is a common grammatically contracted sentence in Japanese that seems to identify the speaker as a foodstuff, but which really only identifies the speaker's preference for it. The archetypal example is "Ore wa unagi da." ?????? Ore means "I" and is used to address only those with whom one has a very close relationship, or who are ranked well below you. wa (?) is the marker indicated that ore is the topic of the sentence. Unagi is eel. The final da is a sentence ending that equates to the be-verb in English, affirming the existence of something.